This weekend I heard on the radio one of the most interesting pieces I've heard in the longest time. The story was about Kermit Oliver, a man who lives in a ranch in Waco, Texas, and who's the only American who designs for the prestigious French house Hermès. This man, who is actually a postman, started working for Hermès in 1980 when the company's North American president of operations discovered him through Lawrence Marcus, Neiman Marcus' EVP. 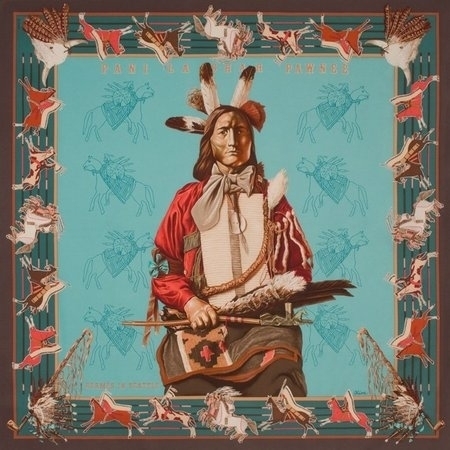 His first scarves collection was chosen by him and the theme was Native Americans and the Pawnee chief scarf came to life. He has collaborated with the company a total of 16 times and counting. Amazingly enough, little is know of this man. He is said to design first the frame of each one of his pieces and then the actual painting is done. His main themes are farm animals, nature and the people around him. He designs the scarve in a span of around 6 monthsup to a year. He does research about each one of his topics, creates the composition and paints them on a 90cm X 90cm watercolor paper, which is the same size as each scarf. The designs are then sent to Hermès, where they are screen printed on silk. Read more about this amazing artist HERE. Thanks for educating me on this, quite interesting, his designs are very creative and unique...the last scarf is amazing. Just wild! A true artist discovered by such a fashion powerhouse and yet still keeping such a low profile. He sounds really down to earth. Oelala, love the last one. Have a great week. Smile loads. This is so interesting! I had no idea. And the fact that he lives here in Texas and not too far away makes it even cooler. 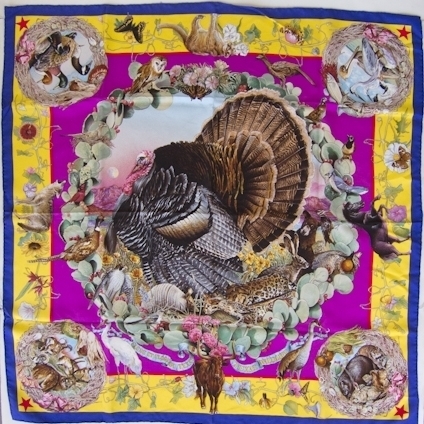 I love Hermes scarves! Seriously. That is very interesting indeed. Wow, love this story! I went to an event at Hermes and the history and technique/craftsmanship that goes into their scarves is amazing! Thanks for your kind comment today! I heard the teaser for that radio program but didn't get to hear it. He sounds like an interesting person though. It kind of seems like a fun job. oh these are beautifully detailed and colorful. wow. i just want one to frame and put on my wall. That is totally fascinating! He is very talented and has such a cool job. This was a very interesting story. His creations are very unique and certainly catch the eye.